The EdTechTeam is undergoing an exciting change. When we founded the company in June 2006, we wanted to “do things right” and began by incorporating in California as a standard S-Type Corporation. I know this sounds like boring business stuff, but trust me… it gets exciting. In recent years, new options have become available in California (and other states). 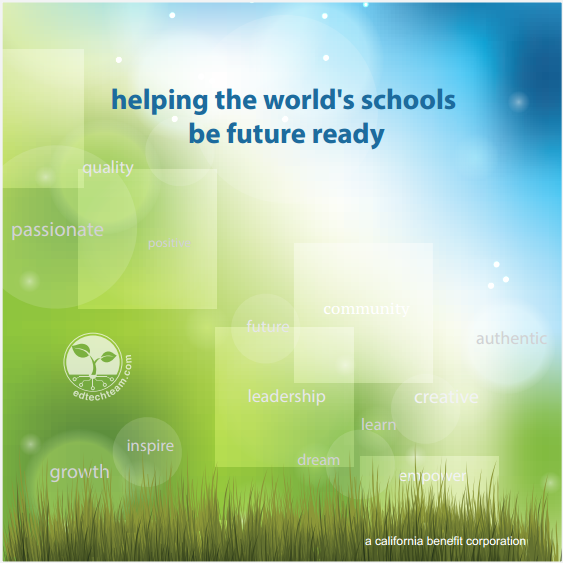 Now, in May 2014 we have made the change to a California Benefit Corporation, allowing us to formally make decisions that put our mission ahead of our bottom line. Our core team went on a three-day retreat in January 2014. Among other things we discovered that we were at least as passionate about our mission (and our giving efforts) as we were about selling tickets to events and signing contracts with schools. We knew our financial success would always be tied to the quality of professional development we provide educators, and the impact of the services we provide educational institutions… but we also wanted to be able to provide services to teachers and schools who can’t afford what we offer (in markets where our operations cannot be profitable). We wanted to build a business where we could not only give away class sets of devices for student use, but we could institutionalize giving as part of what what this company is about, and what we actually do. Ultimately, we wanted to establish a business structure that would never sacrifice our ideals, convictions, and social change goals for the sake of making a sale. We already found ourselves in a place where we were were straddling the space between a mission-driven non-profit… and a profitable corporation. Happily, we discovered that California (and a number of other states) now have a new business structure called a Benefit Corporation. 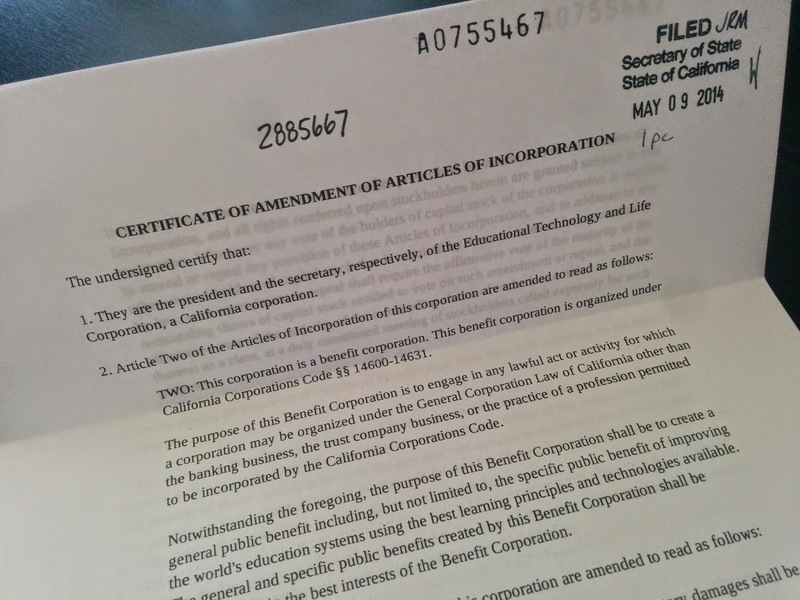 By amending our articles of incorporation to establish the EdTechTeam as a Benefit Corporation we have now formalized our commitment to our mission – and made it legally justifiable for our directors to make decisions that serve our mission before our bottom line. In addition, Benefit Corporations are held to higher standards of transparency and accountability. Among other things, we look forward to publishing our first annual impact report next year. Most importantly, as the company continues to grow, our mission will remain the focus and all stakeholders will know this. We also hope this reorganization will help attract more of the kind of people we want to work with, and allow us to serve more educators who want to see the same sort of change in the world. Most importantly, we hope it will better position us to actually effect the positive social change necessary to improve students’ lives and make the future… better. Our mission is to “improve the world’s education systems using the best learning principles and best technologies available.” In short, we aim to help the world’s schools be future ready. We know this will mean different things to different people, and we’re sure our own articulation of this mission will change over time. But to us this means that we are helping connect educators with each other and with the best (often free) learning tools available… and that we are helping them learn to use the tools for working with their students and colleagues. We’re particularly passionate about open ended tools that help provide an authentic context for student inquiry, creation, collaboration, and reflection. Ideally, we love to see students engaged in solving real-world problems… and effecting positive social change themselves. 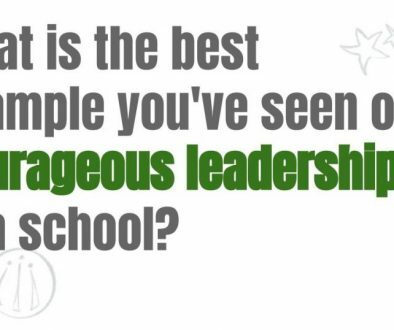 We encourage courageous leadership, empowered teachers, and student agency – as well as access to the resources, devices, and infrastructure necessary to fully realize these goals in today’s world… and in the future. To help make all of this possible, we support communities of educators (and institutions) that share these same goals. With all of this in mind, we have re-committed to making this team blog a community building effort aimed at inspiring and empowering readers to play a role in these changes as well. We will share much more about what the team is doing and working toward – and we’ll share many more resources for educators and students. We hope that many of you will contribute to these efforts – in the comments, as guest bloggers, and by discussing these posts elsewhere in social media and other forums, including face-to-face in school staff rooms around the world. Fantastic work EdTechTeam – inspiring. EdTechTeam is changing the world for hundreds of thousands already… And for millions in the future. I am honored to know you guys. This is why I became a educator in the first place. It's about making a difference in people's lives, impacting change, and doing what is right for society and those who live in it. Well done Ed Tech Team!